The 2019 NCAA Basketball Tournament came to a close earlier tonight. So, it is now time to look at the bracket and compare it to past years. I evaluate how upsetting a tournament is by looking at two stats that I keep during the tournament each year. UF (Upset Factor) is a number that is a sum of the seed differences when a lower seed knocks of a team with a higher seeding. For instance, when a 15 seed knocks off a 2 seed the UF is incremented by 13. If an 9 seed knocks off a 8 seed then the UF goes up by 1. If a 10 seed beats a 15 seed, there are no UF points since the higher seed was the winner. BP (Bracket Points) is probably familiar to most sports fans. When scoring your bracket you get 1 point for a first round win, 2 points for the second round and then 4, 8, 16 and 32 for the following rounds. Basically, you fill out the bracket with the higher seeded team winning each game. You then add up the points based on the tourney results. For the Final Four, the points are given when a #1 seed wins. Here is an example of a perfect tournament where the higher seed always wins. Of course, there has never been a tournament even close to perfect. This year the final count for BP was 124 and the UF was 62. A BP of 124 does not even make it into the top 10, but the UF of 62 was one of the lowest in tournament history. 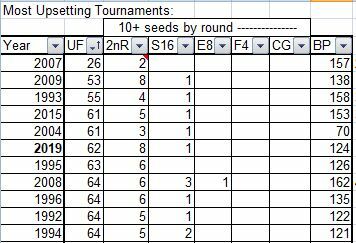 The tournament did start out with a lot of upsets with 12 lower seeds winning in the 1st round. The most lower seeds to win in the 1st round is 13 which happened twice (2001 and 2016). However, in the 2nd round only one lower seed won, which diminished the chance of further large upsets. In the chart above you can see that only five years have had a lower UF than this year. The tournament in 2007 had the lowest UF, with Winthrop and VCU the only double digit seeds making it to the 2nd round. You can also see that there were only five upsets in the 1st round. In the 2000 tournament there were only three upsets in the 1st round, but there were some big upsets in the 2nd round which lead to a higher UF for the tournament. The highest UF was in 2014. You may remember this tournament where an 11 seed Dayton made it to the 4th round and an 8 seed (Kentucky) played a 7 seed (Connecticut) in the final game. The tournament this year was exciting with many close games. There was also an interesting storyline with Virginia winning the tournament a year after being embarrassed in the first round last year by being the first 1 seed to lose to a 16 seed. Virginia did however have to go to overtime in two games, including the final, and barely won the semi-final in the last seconds. It was an exciting tournament, but now it is time for baseball. Would you want to see a tournament that had a perfect bracket? I think it would be a lot less exciting. There is some excitement seeing the top seeds play each other in the final, but it is also fun to see upsets along the way. This entry was posted in Culture, Sports and tagged Basketball Tournament, Big Dance, Bracket Points, Final 4, NCAA Tournament, Upset Factor, Virginia. Bookmark the permalink.